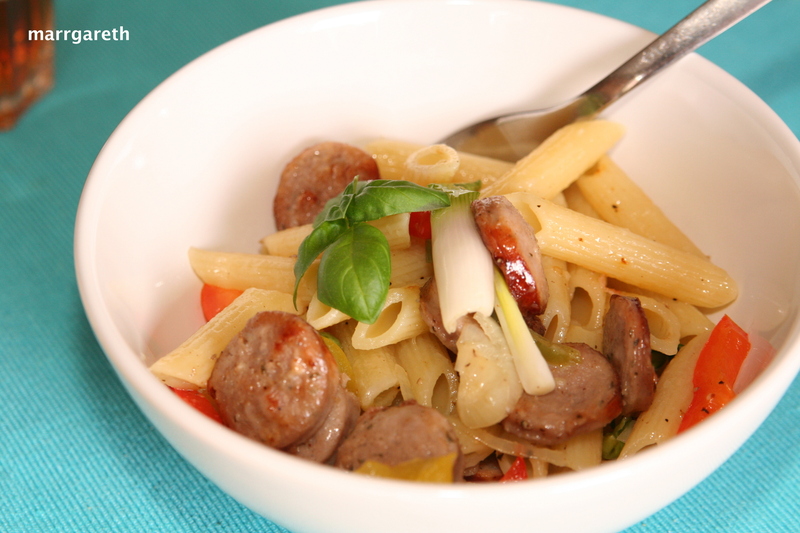 Today I wanted to show you my new dish: Pasta with sausages. I am sure you and your kids will love this one. This dish is quick and easy to prepare and it is suitable for kids with allergies to cow milk and eggs. 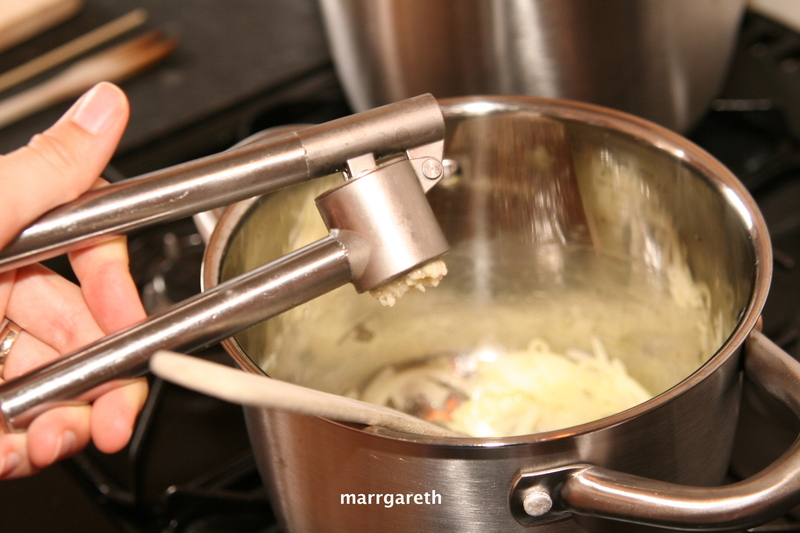 Set a big pot of salted water to cook pasta. If your sausages are raw, like mine, fry them on a pan over low heat on both sides. 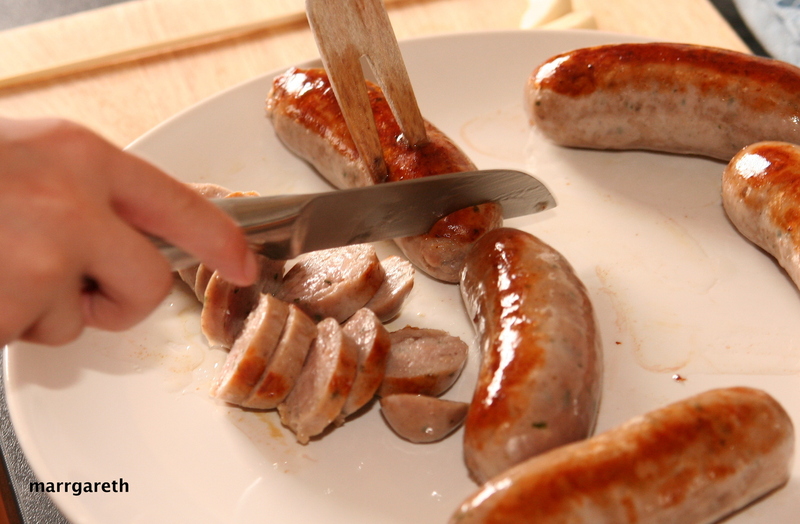 If your sausages are not raw, skip this step and start cutting the sausages into 5 mm slices. 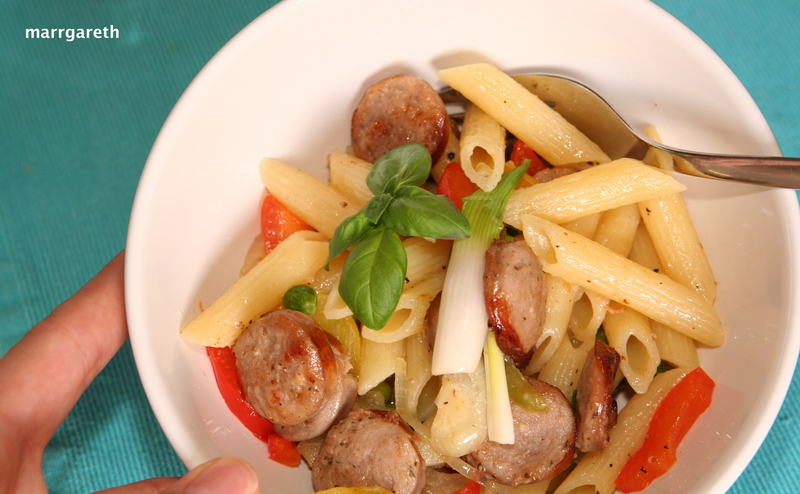 While the water for the pasta is heating up and sausages are frying slowly, prepare vegetables. Wash your peppers then cut them into strips. Cut onion into half-rings. Wash green onion and garlic. Cut green onion diagonally into 1 – 2 cm pieces. If your water is already boiling, cook pasta according to instructions on the package. 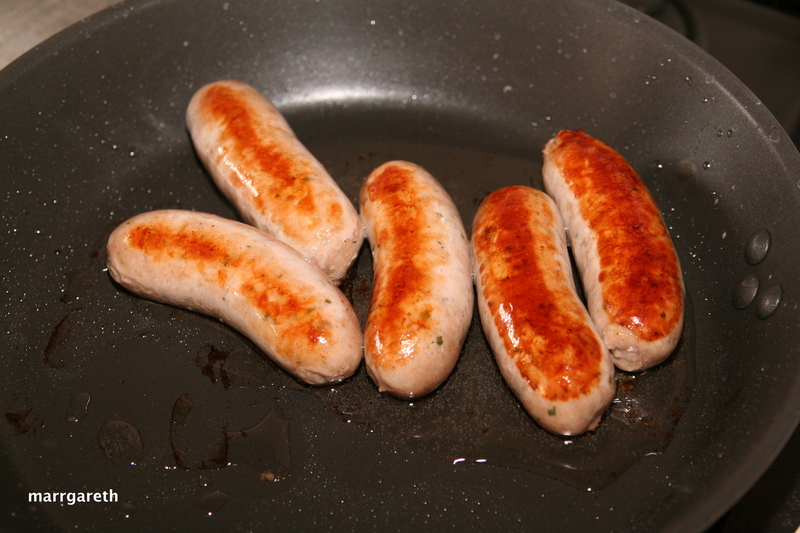 Once your sausages are brown, take them off the pan onto a plate and cut them into 5 mm slices. 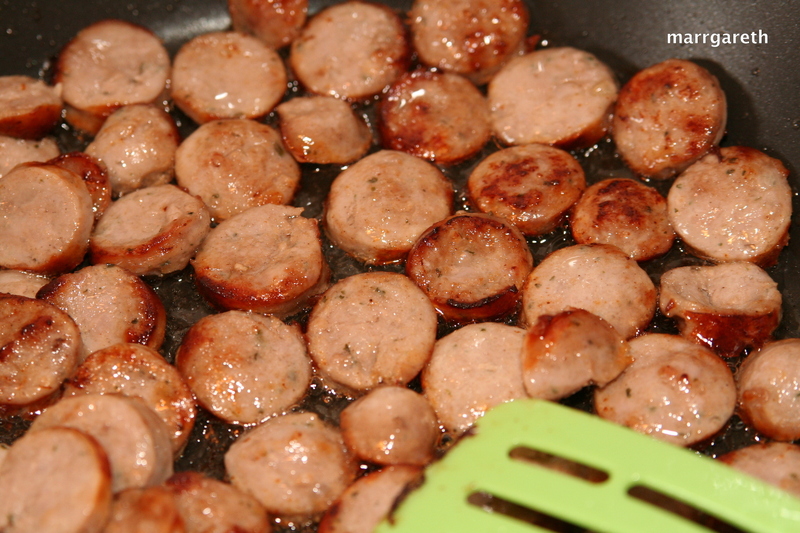 Return the sausage slices back into the pan and fry them again on both sides until light brown. 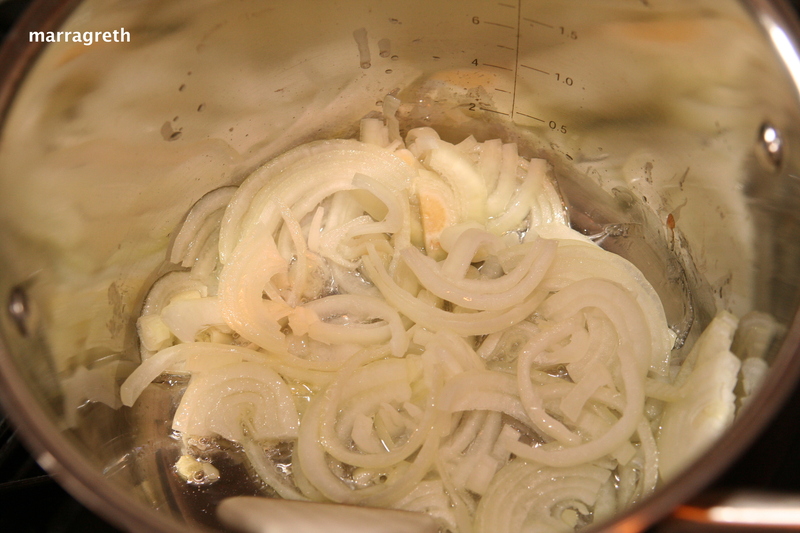 Place the onion and oil into a medium size pan and fry for 3 minutes stirring occasionally. Add the crushed garlic when your onion is soft but not brown yet, then stir. 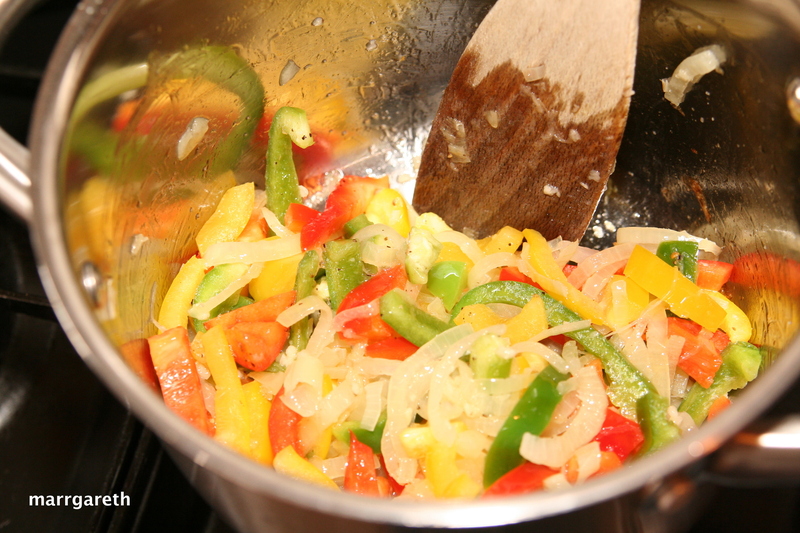 Add the peppers, peas and corn to the onion and fry them for 3 to 5 minutes, stirring occasionally. 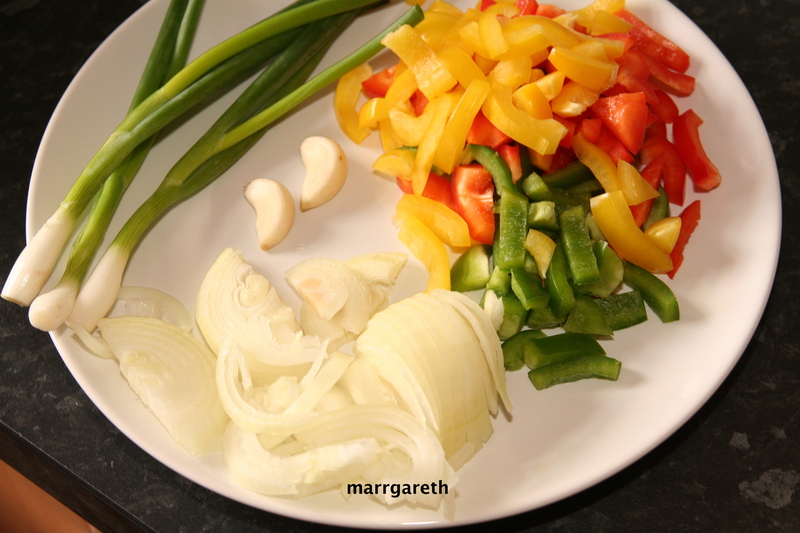 The time of cooking will depend on how soft you like the vegetables, and how big are the chunks. I do not recommend frying vegetables for too long, they will lose their beautiful colour. Season the vegetables with salt and pepper at the end of frying. 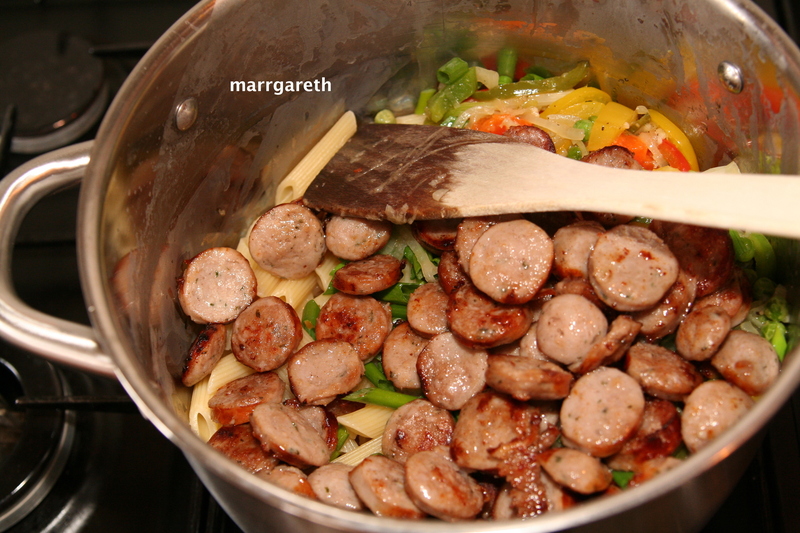 Add the vegetables and sausages to the drained pasta. Do not add the grease from the sausages. Heat the pot for about 1-2 minutes on a very low heat stirring the whole thing. Season to taste. Do not forget to add chopped parsley or basil. If you do not have allergy problems you can add Parmesan cheese.